Public's Opinion Of George W. Bush Is Turning Positive : The Two-Way For the first time since 2005, Gallup's polling shows Bush's "favorable" rating exceeding his "unfavorable" number. The polling firm says it's normal for Americans' opinions of former presidents to improve over time. 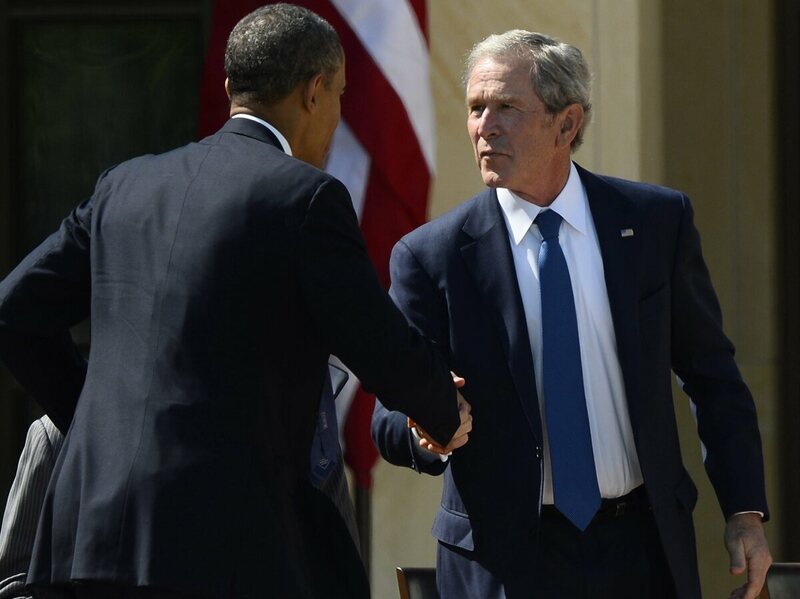 Former President George W. Bush and his successor, President Obama, at the April 25 dedication of Bush's library on the campus of Southern Methodist University in Dallas. For the first time since 2005, when George W. Bush was in the Oval Office, the public's opinion of the former president is "more positive than negative," the pollsters at Gallup say. -- 49 percent of those surveyed have a favorable opinion of the former president. -- 46 percent have an unfavorable opinion of Bush. The June 1-4 survey of 1,529 adults has a margin of error on each result of +/- 3 percentage points. Gallup hadn't asked that question about Bush since November 2010. At the time, 53 of those surveyed said they had an unfavorable opinion of him, versus 44 percent who had a favorable opinion. According to Gallup, "the recovery in Bush's image is not unexpected, given that Americans generally view former presidents positively. Gallup's favorable ratings for Ronald Reagan, Jimmy Carter, George H.W. Bush, and Bill Clinton all exceeded 60% when last measured." "It would not be out of the question for Bush's image to continue to improve in future years. But Bush's image improved more from 2009 to 2010 than it has in the past three years, even with a recent round of positive publicity from the opening of his presidential library, so that is not a guarantee he will see the 60%+ favorable ratings enjoyed by other former presidents anytime soon." The current president's current rating is also just into positive territory. According to Gallup's daily tracking poll, 47 percent of those surveyed approve of the job President Obama is doing — versus 44 percent who disapprove. Those results also have margins of error of +/- 3 percentage points.